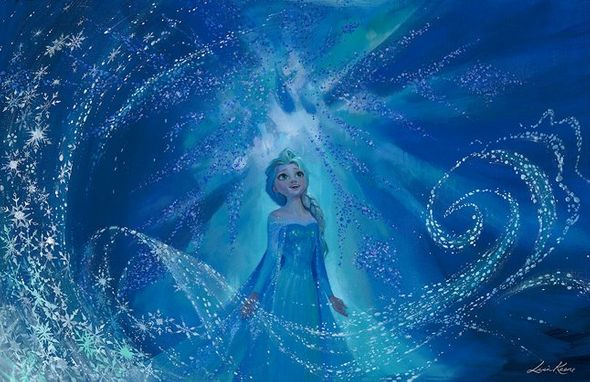 Home | Disney and Animation Art | Disney Feature Films | Frozen | Lisa Keene Signed and Numbered Hand-Textured Giclée on Canvas:"At One With The Wind and The Sky - Frozen" OFFICIAL | Gallery Direct Art | 800-733-1144 Free Ship. No Tax. Lisa Keene Signed and Numbered Hand-Textured Giclée on Canvas:"At One With The Wind and The Sky - Frozen"
Edition: Giclée on Canvas | Edition of 195 with COA. About the Artist: Throughout the history of The Walt Disney Studios and its unparalleled role in shaping the course of animation in film, few artists have been able to contribute on the scale and scope that Lisa Keene has over the last 28 years. After studying art at USC and The Art Center College of Design, Lisa went on to become a major artistic influence in some of the most beloved Disney Classics of all time. Her first role with the studio was as a Background Artist for The Black Cauldron (1985) and her career as a Background Painter, Stylist, Character Designer, Visual Development Artist and Art Director has since spanned four decades. Her resume includes such films as The Lion King, Beauty and the Beast, The Little Mermaid, The Rescuers Down Under, Princess and the Frog, The Hunchback of Notre Dame, Tangled and many more. She also served as the Animation Art Director for Disney's modern fairytale Enchanted. Lisa is a contributing fine artist to the Disney Storytellers art collection, a special portfolio of Disney Fine Art (published by Collectors Editions) which showcases fine art interpretations of Disney classics by some of today's most talented Visual Development artists from Walt Disney Animation Studios. In her first paintings created for this special portfolio, Lisa chose to explore a more modern take on the classic Disney princess, aimed at creating fresh interpretations of Disney's royal heroines that would appeal to a modern audience. Lisa is a contributing fine artist to the Disney Storytellers art collection, a special portfolio of Disney Fine Art which showcases fine art interpretations of Disney classics by some of today's most talented Visual Development artists from Walt Disney Animation Studios. Home | Fine Art Prints & Limited Editions | Collectors Editions | Disney Fine Art | Lisa Keene | Lisa Keene Signed and Numbered Hand-Textured Giclée on Canvas:"At One With The Wind and The Sky - Frozen" OFFICIAL | Gallery Direct Art | 800-733-1144 Free Ship. No Tax. Home | Disney and Animation Art | Disney Fine Art | Lisa Keene | Lisa Keene Signed and Numbered Hand-Textured Giclée on Canvas:"At One With The Wind and The Sky - Frozen" OFFICIAL | Gallery Direct Art | 800-733-1144 Free Ship. No Tax. Home | Disney and Animation Art | Disney New Arrivials | Lisa Keene Signed and Numbered Hand-Textured Giclée on Canvas:"At One With The Wind and The Sky - Frozen" OFFICIAL | Gallery Direct Art | 800-733-1144 Free Ship. No Tax.